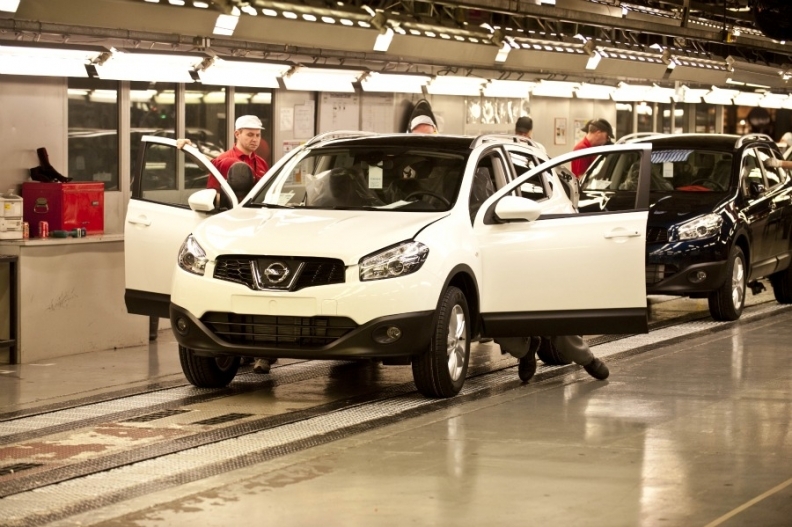 Building the Qashqai, shown, in Russia will enable Nissan to avoid import tariffs. SUNDERLAND, England – Nissan will transfer some production of its Qashqai compact car to Russia from the UK. The move is part of a plan to double annual production at the automaker's factory in St Petersburg to 100,000 by 2014, said Colin Lawther, Nissan's vice president of engineering. Russia is the largest market for cars built at Nissan's plant in Sunderland, northeast England. The carmaker's vehicle sales in Russia climbed 73 percent in 2011 to just under 60,000 cars. Last year, the Sunderland plant produced 301,277 Qashqais running three shifts at maximum capacity. Next year, Nissan will start production of the Leaf electric car for European markets in Sunderland on the same line as the Qashqai. "We will generate some headroom by moving some production to Russia," Lawther told Automotive News Europe. The Qashqai production transfer will happen when the next generation model is launched in two years. Lawther did not say how much production will be moved to St Petersburg. The St Petersburg factory currently builds the Teana sedan, Murano large SUV and X-Trail medium SUV. After 2014 the factory will also make the X-Trail's replacement, previewed at the Geneva auto show by the Hi-Cross concept. All Qashqais made in Russia will be sold there, allowing Nissan to avoid import tariffs. "Effectively we have a 30 percent handicap right now," Lowther said. Last year, the Qashqai was Nissan's best-selling car in Europe with volume of 216,970 units, up 1.3 percent from the year before, according to JATO Dynamics. Nissan also builds the Juke small SUV and the Note small minivan in Sunderland. Last year the factory built 480,485 cars in total. Nissan will replace the Note next year with a sleeker subcompact model based on the Invitation concept shown at the Geneva auto show this year, also to be made at Sunderland.